I’ve officially run out of blog titles and things to say. Or maybe it’s just one of those days when my brain decides to shut down on me. Thanks a lot, brain. So what was I saying? Oh yes, my top. It’s actually from London-based brand Jovonna. You’ve seen me wear this brand a couple of times already. Naturally, I’m a fan. I have a soft spot in my heart for British brands like Jovonna. No one does high street better than the Brits which is why London ranks high on my travel wish list. Maybe this year. I just can’t stop smiling while reading this post.. Just so random and this is the real you, Ms Camille! =D This is why I love reading your blog.. And your outfit? Chic as usual and I seriously love your jeans.. Your pants are very beautiful and I like your jewels. can i buy the top in the mall? glo? do they have any branch here in the phil? I love it when you reply on my comments. I just can’t help but smile because you always find time to reply. You’re definitely not just an awesome blogger but a beautiful woman inside an out. I am fortunate to be able to search through the internet to see your blog, I can see you in three years insisted update your blog brings exciting fashion trend, to be sure that you have very successful. I’m very impressed! Dress like you bring another style, full of rich gold. Overall dress with a very coordinated. Hi Camille, you are my favorite blogger because you can write really well. Your blog is not just all about outfits and being pretty. I like reading through your short messages as I feel that you are really talking to your readers. It’s understandable that you might sometimes lack words to say since you post regularly, but you always manage to add witty remarks or comments that make me smile and relate more to your experience. Nice outfit! I especially love the pants and bag! 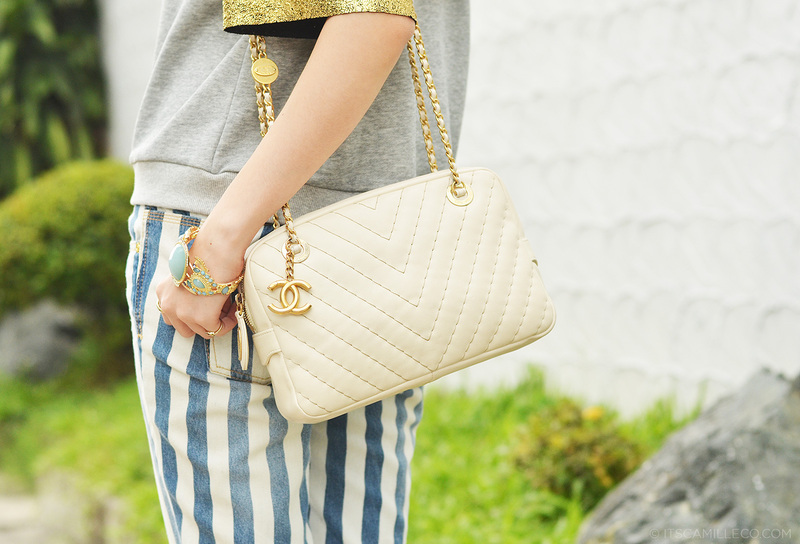 :) May I know the name of that Chanel bag? I really like it and it’s not the typical Chanel bag I see on magazines/online. Great take on fresh-casual, miss Camille! I particularly love how your gold sleeves catch the light. It’s your braided necklace that steals the spotlight, though. It’s a shade of gold that I always associate with glam girls who can really carry the model-off-duty look. Are you on your way to a photo shoot, perhaps? This is a very eye-catching outfit that will surely turn heads. I scrolled to the bottom to get your full-body shots and was really pumped by the surprise I got from your cherry-red shoes. Was not expecting that piece, I tell you! The spontaneity is very much a welcome treat. The whole look is so varsity-chic. The details of your clothing articles gave me quite a wow too. I’ve only seen colored jeans, but striped patterned ones, I haven’t yet discovered till I read through your post. :-D Love the blue pattern of stripes for your denim here. Your legs look long and willowy even when they’re sheathed in jeans. I think I’ve seen you wear those pants on a blog post where you took a trip somewhere. I just can’t remember exactly where. Was it the one where you went to go see the Pronovias fashion show? Or not? Anyway, I love this outfit Cams. Cool and relaxed. I agree the Brits have awesome street fashion. London’s on my travel bucket list too! When I went to Spain! :) Yes :) Good memory! Camille, you really don’t need to say anything with your shots. Those gorgeous shots speak for themselves. Don’t worry, it’s almost over! Just a little bit more! Summer is coming! Love the details on the sleeves, and how you paired it with striped pants. Very interesting! I will :) Thank you Mitch! Looking great! All these different colors and yet it fit’s perfectly together. The colors mended so well together in this outfit. Never thought those pants would work with gold, but they wore beautifully. Thanks for sharing. This outfit actually gave me good ideas. I love these jeans. Stripes make such a pop and statement. I love the way you styled it with red heels and touch of sparkle! Thanks Ren! How I wish too! Your hair really shines! X), even though you were running out of ideas what to write I still enjoyed it ! Keep it up! Oh yay! Thank you Vong!